As I mentioned earlier, I spent the day on Saturday demonstrating how to cook on the Big Green Egg, answering questions from current & prospective owners, and helping the local dealer with their big spring event. I had the two Big Green Eggs lit by 7:15am, and the first side of ribs went on by 7:30am. I staggered the start times of baby back ribs, so that we had finished samples at staggered times later in the day. We then put biscuits & sausage on the XL Big Green Egg and the early attendees were treated to breakfast. The rest of the day, we kept a steady supply of ABT's, spatchcocked chickens, pork steaks, pizza, and bacon wrapped meatballs on the grills. By 8:00pm, my dogs were screaming and I was glad to pack it in and call it a day. 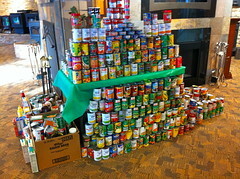 By all accounts, the dealer had a good sales day and collected quite a lot of canned goods for their food drive. I'm pretty confident that we made converts of quite a few grill buyers. Mission Accomplished! Here is a link to the rest of the Grillfest 2011 Photos. Just like last year, my buddy & I will be demonstrating the Big Green Egg for the local dealer. This is their annual wing-ding where the manufacturer's representatives come and display their wares, answer questions about their products, and cook samples for folks to try. 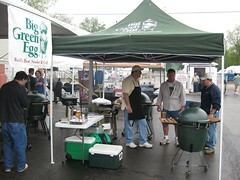 Last year the Big Green Egg rep couldn't make it, so we stepped up and handled the demo in his place. They asked us back for another demo on Father's Day weekend also. I don't mean to brag, but between the two demonstrations and their normal sales efforts we sold every Egg of every size that they had ordered for the entire season....and then some. So if you don't have plans this weekend, come on down to Hearthside Grill & Fireplace to check out the Big Green Egg (as well as the Weber, Traeger, & Holland line ups). One Block East of the Fairgrounds. We'll be there from 8:00am - 8:00pm this Saturday, April 30th. Hope to see you there! A couple of years ago I was in my local grill and fireplace store, Hearthside Grill and Fireplace in Belleville, IL. 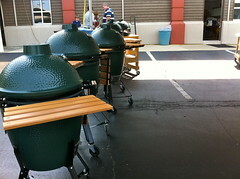 As I chatted with the folks there, I found out that they were in process of becoming a Big Green Egg dealer. They took my name and number and I told them that I'd be happy to help them out any time and I'd like to be on their mailing list for any special events. I've probably only been in the place a couple of times since then, but out of the clear blue sky I got a phone call about 2 months ago. It was the lady I'd spoke with and she was inquiring about whether I'd be available to demonstrate the Big Green Egg at their annual Grillfest. It seems that the regional BGE representative wasn't available and all the other manufacturer's reps would be there demonstrating their products. I readily agreed and the day finally arrived. Grillfest 2010 at Hearthside Grill in Belleville, ILI enlisted the help of my neighbor and good friend and together we prepped 100 ABT's, ribs, a fatty, and pork tenderloin for the event. I arrived at 7:30am and found the other reps alredy on site and beginning to cook. So I quickly got a fire going in both the large and extra-large Big Green Eggs that the folks had for me to use. Dave Dey & Jay "Braddog" BradshawI staggered the start time of 3 racks of ribs so that the finish times would be staggered throughout the middle of the day. That worked really well. We put the fatty on with a pan of biscuits and had samples of those early in the day. We also had ABT's going in small batches throughout the day. Along about lunch time, the local Papa Murphy's showed up with 16 ready-to-bake-pizzas so we configured the XL BGE for baking pizza. This was the first time that I'd cooked on an XL and the first time I'd cooked pizza on the BGE. This rocked! I'll definitely be doing this again at home. There were a couple of notable moments during the day that really provided me with a little personal validation. I noticed the Holland Grill rep hanging around and listening to my conversation with a prospective buyer. Afterwards, he commented, "You guys are waaay better than the BGE rep". One of the guests had spent a lot of time with me talking about the BGE. He then wandered over to the Traeger tent and sampled a rib. He happened back by as I was serving up rib samples. He leaned over to me and said, "I know it's not a competition, but your ribs beat the Traeger ribs hands down". It was a long day, but I loved it. I think the dealer was satifisfied with our effort and maybe they'll ask us back next year.